When Arup first arrived in London in late 1923 he lived with cousin Arne's parents in Kew. But soon he moved to a bedsit in Cambridge Street, Pimlico, which was within walking distance of Christiani & Nielsen's office at 92-94 Victoria Street where he was employed. He was to stay at Cambridge Street until his marriage in 1925. These early months were difficult, as he felt rather lost and cut off from his social and intellectual circles. Professionally, what Arup took with him when he moved to Christiani & Nielsen's London office was the firm's emphasis on good design and learning from the experience of those who had come before. He remembered that the firm "distributed to all their engineers a whole library of original reports on interesting jobs, designs, tests, original inventions and various design data", enabling a thorough understanding of the tools and practices of previous generations. Arup worked under Herluf Forchhammer, and it was he who had established the practice of regularly distributing technical reports, a practice Arup would follow years later in his own firm. 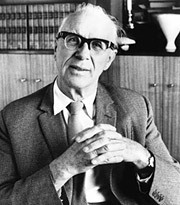 Arup himself added to Christiani & Nielsen's archive — he had already started to publish many well-reputed articles on reinforced concrete, piers and jetties. However, Arup was lonely in his early days in London. The rest of the family were in Copenhagen and kept in touch by letter. His mother and step-sisters kept him abreast of family developments, including brother Henning's escapades. Although he saw himself as an outsider in the UK in terms of his philosophical approach, his expertise in maritime projects and reinforced concrete led to important friendships, among them the now-revered engineers Pier Luigi Nervi (1891-1979) and Felix Candela (1910-1997). His other important ally was to be his Danish wife, Ruth Sørenson, otherwise known as Li. They met at a tea-dance at the Anglo-Danish Society in London and were married on 13th August 1925, when they moved into a furnished studio at 7 Albert Studios, Albert Bridge Road. In 1926 they moved to Bedford Park in West London for a time. Later they would live in Harrow, then 28 Willifield Way, Hampstead Garden Suburb (1929), where they stayed until World War II. Their daughter Anja was born in January that year. Li was sympathetic to his work — her father was a civil engineer and director of Copenhagen's water supply. They were to have three children and be together for sixty years. The happiness they shared saw Arup through many years of alienation in the British construction industry. The health of Arup's mother declined through the late 1920s and she died in March 1931 in Copenhagen. Arup did not make it there in time to see her. Li was expecting again. Their son Jens was born in May 1931. The large wider family at this point was now scattered across Denmark, Norway, the UK and the USA. In the thirties Arup started to meet like-minded individuals, the most significant of whom — architect Berthold Lubetkin (1901-1990) — appeared in his life at a time when he moved from Christiani & Nielsen and began to realise his dream of using his engineering expertise to benefit the design of buildings from conception to construction.